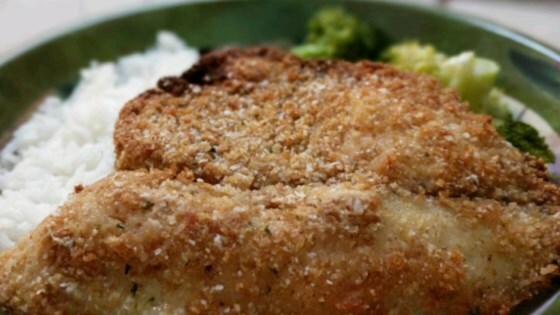 "A quick and yummy way to prepare crispy tilapia the whole family will love, without frying. I get asked to make this several times a week by everyone in my family, especially the kids!" Line an 11-17-inch baking sheet with aluminum foil and lightly spray with cooking spray. Mix milk and ranch dressing in a shallow bowl. Place flour in a separate shallow bowl; set aside. Whisk together bread crumbs, Parmesan cheese, seasoned salt, black pepper, celery salt, garlic powder, onion powder, paprika, parsley, and basil in a bowl. Spray bread crumb mixture with cooking spray until damp, then whisk bread crumbs. Repeat spraying and whisking 3 more times to lightly moisten crumb mixture with cooking spray. Transfer crumb mixture to a large resealable plastic bag. Gently press tilapia fillets into the flour to coat, and shake off the excess flour. Dip the fillets into the ranch dressing mixture. Place all the fillets into the resealable plastic bag; seal bag and shake to coat fish with bread crumb mixture. Arrange tilapia on prepared baking sheet. Lightly spray the breaded fish with cooking spray. Bake in the preheated oven until the fish is easily flaked with a fork, 20 to 25 minutes. Turned out GREAT.... I used olive oil instead of cooking spray!! I made this exactly as the recipe directed and it was awesome! My husband and daughter are not big fish eaters but they both liked this a lot! Thanks! These were crispy but I didn't really detect the ranch flavour like I wanted to. Next time I'll either reduce the milk or leave it out, and I'll swap the bread crumbs for panko breading. Great flavor w/crunchy breading. Loved it! My fish was done at about 16 min. Thanks! !